We get this question a lot from Twin Cities homeowners. 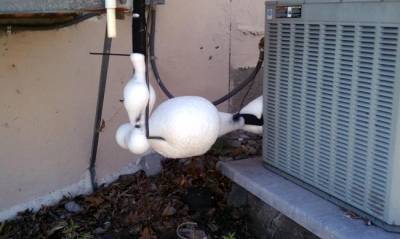 And you’re right to be confused—it’s definitely not normal to see ice on your air conditioner refrigerant pipe when it’s 90° outside. In this article, we’ll go into more detail about each of these issues and what you can do to fix them. Want an AC contractor from St. Paul / Minneapolis to fix the problem for you? An evaporator coil in a central AC unit. Warm air blows over the evaporator coil, refrigerant removes the heat from the air and then cold air is pushed back in your home. The evaporator coil is the part of your AC system that cools the warm air taken from inside your home. The evaporator coil uses refrigerant (a liquid/gas) to absorb the heat from your home’s warm air. Once the refrigerant absorbs the heat, the (now) cool air re-enters your home. But if there is a lack of warm air blowing across the evaporator coil, then the refrigerant gets too cold, which can cause the refrigerant line that connects to your outdoor unit to freeze. So, what causes this low airflow issue in the first place? 1. Change your thermostat setting from COOL to OFF. 2. Turn the fan setting to ON instead of AUTO and then wait 3 or 4 hours before turning your AC back to COOL. When your thermostat is set to ON, the blower will constantly bring in warm air, which will help thaw the ice on your outdoor pipes. The ON/AUTO setting on a thermostat. 3. Check your AC filter. If it’s dirty, throw it away and replace it with a new one. 4. Make sure your return vents are clean and unobstructed and your supply vents are open. This will help improve airflow into your system. A supply vent (where cold air enters your home). A return vent (where warm air enters your AC system to be cooled). 5. Contact a professional to inspect your AC to make sure your blower, evaporator coil and ductwork are in good shape. If your system is low on refrigerant, then the temperature of the refrigerant remaining in your system can drop due to reduced pressure, which causes the refrigerant line (pipe) to freeze up. But here’s the thing: Refrigerant circulates in your system (from your outdoor unit to your indoor unit) in a closed loop. That means if your system is low on refrigerant, it has a leak. Unfortunately, if you think you have a refrigerant leak based on the signs above, there’s not much you can fix as a homeowner. You see, refrigerant is a poisonous chemical that only a certified professional should handle, so you’ll want to leave fixing a refrigerant leak to the professionals. Need help from a Minneapolis-St. Paul Heating and Air Conditioning tech? Our HVAC techs have the highest training and experience to fix your air conditioner quickly and thoroughly. We also offer a 100% customer service guarantee on all of our air conditioner repairs.